The following email is broadcast to over a dozen technicians and other trained individuals who will quickly respond to your question. Please Email: support@o2cm.com for help on the adminstrative tools O2CM provides. There are two methods for advertising your dance related wares or events on O2CM. Present your products to competitors and spectators on our live.o2cm.com site. Sign up at advertise.o2cm.com. 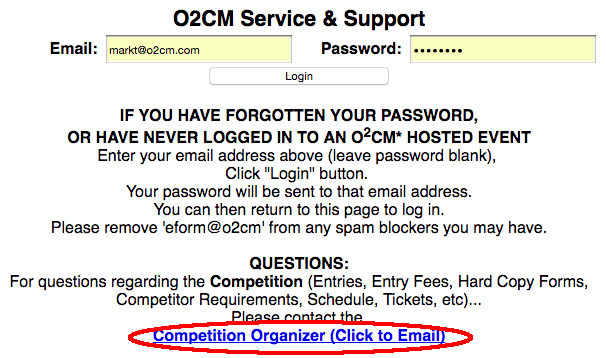 Even if you aren't using O2CM now, you can get your event on the O2CM event list by going to our Get Started page and registering your event. When you do decide to use O2CM, you will have a database ready to go.